One of the most well-studied genetic polymorphisms in the behavioral- psychiatric- cognitive-genetics area is the 5HTT-LPR, a short repeating sequence that mediates the transcriptional efficiency of the serotonin transporter. Given the wide-ranging effects of 5HTT on the developing and mature nervous system, it is perhaps not surprising that variation in 5HTT levels can have wide-ranging effects on brain structure, function and behavior (see here and here for 2 of my own posts on this). One of the latest findings has to do with the issue of “functional connectivity” or the degree to which 2 separate brain regions co-activate and interact with each other – this type of functional interaction and integration of brain systems being a good thing. Earlier studies have shown that individuals who carry the “short” allele at the 5HTT-LPR show less coupling of their frontal cortex (perigenual anterior cingulate cortex) with their amygdala – which perhaps indicates that their frontal cortex has a harder time regulating the amygdala. This may be a mechanistic explanation for why such people have been found to be more prone to anxiety. A new study by Pachecco et al., seems to support this mechanistic account – however, they confirm the coupling model using a different neuroimaging modality – which makes the paper especially interesting. In their article, “Frontal-Limbic White Matter Pathway Associations with the Serotonin Transporter Gene Promoter Region (5-HTTLPR) Polymorphism” [doi: 10.1523/JNEUROSCI.0896-09.2009] use a method known as diffusion tensor imaging, a modality that is particularly sensitive to white matter tracts that are known to function as high-speed interlinks between disparate areas of the brain. 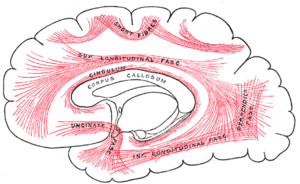 They find that a particular tract – the left frontal uncinate fasciculus – is differentially formed, and is less so, in carriers of the short allele. The authors suggest that the association of the 5HTT-LPR with functional connectivity may be somewhat due to the white matter tracts that connect separate brain regions. Interestingly, the finding was not seen in other white matter tracts (fasciculi) – which suggests that the genetic polymorphism is interacting with other – yet to be identified – factors (environment perhaps?) that lead to such a specific difference.